In the late 90s, while in school, my wife spent a year living in Australia; while there she took many side-trips to New Zealand. Her tales and photographs, coupled with the below guide from the Ruby Suns Ryan McPhun, have about convinced me to drop everything, load up a backpack and catch the next flight out of LAX. But alas, I cannot, so this amazing entry into our Off The Record series will have to do. 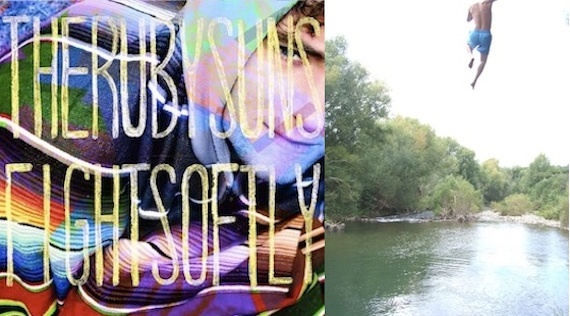 The Ruby Suns third LP, Fight Softly, drops March 2nd via Sub Pop and the band begins their American tour March 11th. A river I don’t know the name of in the Waipoua Forest near a campground I’ve stayed at but can’t remember the name of, Northland, NZ :: We were on the road on the way to check out Tane Mahuta (world’s oldest Kauri tree) when we passed a spot that I’ve been to before. It’s a river that has some great little swimming holes. There’s also a DOC (department of conservation) campground upriver that I’ve stayed at before. The first time I swam in this spot the water was absolutely freezing. This time it was perfect and someone had added a rope swing to the mix. The rope wasn’t very thick though so it was a bit sore on the hands. 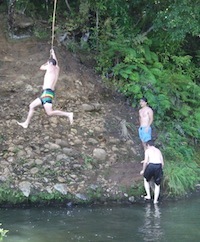 But it got us in a rope swing fever. 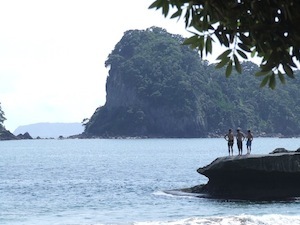 Secret Swimming hole near Tairu on Highway 25 on the Coromandel Peninsula, NZ :: This place is incredible. I was recommended this spot by a friend years ago. it’s on the road to a great campground in the broken hills, a lush area of native forest. on a walk near this campground you can even go into an abandoned mine shaft that has glow worms on the celing. it’s pitch black inside so you have to use a torch to see where you’re stepping. but you can’t shine the light in the ceiling where the glow worms are because they’ll stop glowing, plus there are wetas (something like cockroaches but about twice the size) hanging from the ceiling and you don’t want to see those guys. anyway, the swimming whole is on a river and there’s a large bank on one side where you can either jump into the water or take the deceptively high hope swing. killer! Cathedral Cove, Coromandel Peninsula, NZ :: I think this place was featured heavily in the recent Lion, the Witch and the Wardrobe film. Can’t remember. But basically there’s this massive gap in this hill that you can walk through. google image search it and see for yourself. There’s also a rock that you can jump off just out from the shore. there are all sorts of spots that you can jump from. some places you land in a little strip of ocean in between two bits of rock. 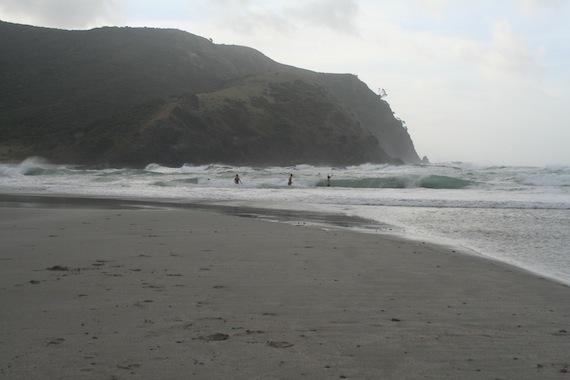 because it’s not too far from the beach, the waves greatly effect the water level so you have to time when you jump. kind of exhilarating. There are also other rocks that you can swim out to and have a walk around or just jump off. Waterfall and tiered swimming holes, near Waipu, NZ :: This is a place I’ve been to a few times. There’s a sign on the side of the road that says ‘waterfall,’ that way, 11kms. Can’t remember the name of it! This place is like a miniature version of those tiered waterfalls in Hana, Maui. There was no one there when we got there, which was great. The water is in a little rocky valley, the rocks being nearly black in colour, as per the photo. This makes the water look black too so you can hardly see your hand in front of you. This spot made for a great cool down stop off. We were headed to the northernmost point in New Zealand, Cape Reinga, and it was a hot day and there were six of us with heaps of camping gear crammed into this minivan. Tapotupotu Bay, Cape Reinga, NZ :: Google search this spot and it will freak you out. It’s basically right at the northern tip of New Zealand and there’s a campground right at the beach. Incredible! Our morning and evening rituals while we were there were to get pounded by the surf at the beach. We didn’t swim out too far because there was a real strong rip current and with pretty big swell, especially on the sets, it was a dangerous combo. But there’s nothing like body-surfing a near head high beach break for a good pummeling. We camped in the most inland camp spot at the campground, right at the shore of this tidal inlet. It was most likely a river that flowed to sea, but on the incoming tide you could float ages inland on this river/inlet and on the outgoing tide it would take you right back to our campsite, with some trees to jump off along the way. Choice! Cranberry Lake, Fidalgo Island, Washington, USA :: This is the only non-NZ spot I’m going to talk about. Though I’ve had many a great swim in the states this one tops the bill for it’s uniqueness, or rather, the situation in which I first met this lake. We’d been living in seattle for a couple months in late ’08 and we went up to Anacortes to visit a friend that was doing an artist in residence up there. although it was a rainy day, he took us to this amazing little lake (that he said we HAD TO SEE) and we were the only people there. 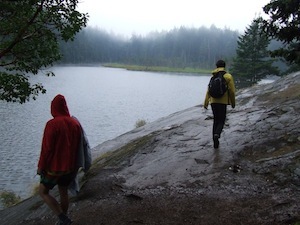 we all went for a swim even though it was a bit chilly and rainy, but it paid off. there was a big sloping rock to jump off and once we were in the water (which seemed to be warmer than the outside temp) we were glad we made the trip. This was a swim that reminded me of my slight fear of dark water (isn’t there a movie called ‘dark water’?). The water was really dark partially because of the overcast weather but also because I’m assuming the floor of the lake was either stone or reeds or something like that. The brooding weather made it that extra bit eerie. Funny because this lake is actually right near Mt Erie. Later that night there was a big jam at the place where our buddy was staying, so we mucked in. Karl Blau and Phil Elverum (Mt Eerie, The Microphones) were there too. Go figure! When we got back to Seattle I ended up writing a song about that day. I saw these guys open for the dodos here in nyc a few months back. They were really fun, and the banter between songs was hilarious. They seem like real chill folks. Cheers. can you tell me where the picture next to the ruby suns picture is located and also what road you have to turn right at to get to the waterfall in waipu?